Katrina Dainton from Forest Research will deliver this Aberdeen Entomological Club seminar entitled “A tale of two beetles”. It will be held at the James Hutton Institute in Dundee (and screened to the Institute’s Aberdeen site). In this talk Katrina will discuss two pest species, their impact on Scottish forestry, and current and potential strategies for their management. The large pine weevil (Hylobius abietis) is a native species that breeds in clear-felled conifer sites and causes damage to restock trees. 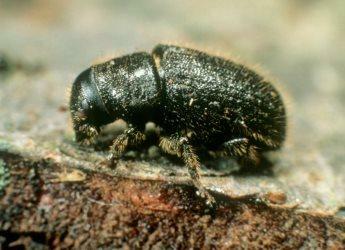 The great spruce bark beetle (Dendroctonus micans) was discovered in the UK in the 1980’s and breeds under the bark of spruce, debilitating or killing mature trees. The distinct behaviours of these two beetles contribute to their pest status, and are also key in the development of species-specific IPM strategies. The talk starts at 4:00 pm with light refreshments available from 3.30 pm.